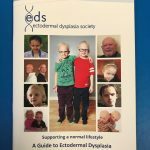 If you, your loved one or someone you know has been diagnosed with Ectodermal Dysplasia, the ED Society is here to help by providing information and to support you through this difficult and complicated time. Regardless of when you or your child received a diagnosis, the following few days are often the hardest. You may be confused, sad, scared or even angry to be told that you or your child has a genetic condition. Some people accept the diagnosis and immediately move along to find out what to expect next, others experience the classic stages of grief. Whatever your response to the diagnosis, please know that there is no “right way” to react, you should not feel guilty about being sad or angry and also one parent often reacts differently than the other. The diagnosis of a genetic disorder does not mean the end of their world or yours. Things might feel unfamiliar until you find a way to speak about and understand what they have, but you or your child are still who they are and who they have always been. The jumble of letters and numbers which form the diagnosis will eventually stop feeling as overwhelming as it does now. The ED Society aims to create a place for you to find answers to the questions piling up in your head, from the best way to manage Ectodermal Dysplasia on a daily basis, to dealing with medical and education professionals/authorities, and seeking any funding which may be available, don’t worry we will point you in the right direction. These are available to buy here . You may not wish to know everything now, but we’ll be here when you are ready. So, when the time comes please email us.